Sometimes things look so bad you wonder if you have any chance at all. In that case, no, you don't have a chance. The chance died. So we use the expression "ghost of a chance". What does that mean? If you don't even have a ghost of a chance it's best to give up, roll over and play dead. That may attract the ghost of a chance back to you. Better to have chance's dead ghost than none at all. Let's say you get the ghost of a chance back but you're having a devil of a time. What then? Maybe that's what happened in 1876. Little Big Horn, June 25, 1876: mostly unnoticed by General Custer's scouts a small blurry object was seen traveling away at high speed while on their way to the battle. 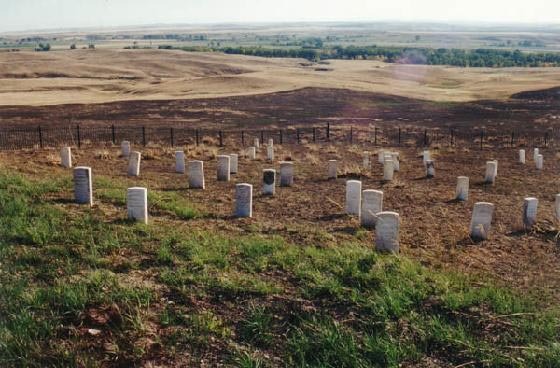 Historians claim that was Custer's luck running out. He and 268 of his men in the 7th Cavalry died that day. Chance didn't even have a ghost. The great leader of the Lakota Sioux was Sitting Bull at the time of Custer's Last Stand. A decade later the Ghost Dance movement spread across the West. The Ghost Dance was an updated version of a prehistoric dance. The movement was a millennial-type prophecy that the White Man would be swept away peacefully and stop their expansion. But did the Ghost Dance have a ghost of a chance to succeed?